Doom and gloom from Felix Salmon (emphasis mine). Why, I ask myself, do I keep posting this depressing stuff? I don’t know, I answer; I can’t help it. Like worrying a bad tooth, I suppose. 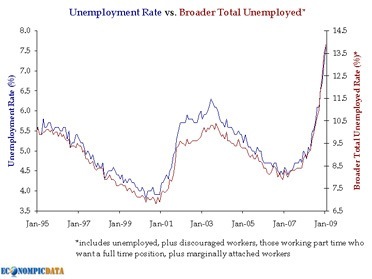 Jake at EconomPic Data has the chart: narrow unemployment is now at 7.6%, while the broader measure of underemployment is a whopping 13.9%. Jobs are important to the stock market because if people are unemployed, they aren’t likely to maintain their spending, buy a house or keep up with their debt payments. And three of the biggest problems facing the economy are dampened consumer spending, the housing market’s slide and accelerating loan defaults. Not to mention the fact that we’re going to embark upon a wave of corporate debt defaults very soon now. It’s all well and good to mark down bond prices to anticipate a higher default rate, but when it happens it’s always a shock. I still think that things are going to get worse before they get worse: I just can’t for the life of me see the engine for any recovery. Certainly the stimulus bill isn’t going to do it on its own — the economic problems facing the US are so large that the government can at best only try to make things slightly less bad than they otherwise might have been. But just as the boom fed on itself, so does the bust. Which means that this recession could drag on for a very long time yet.